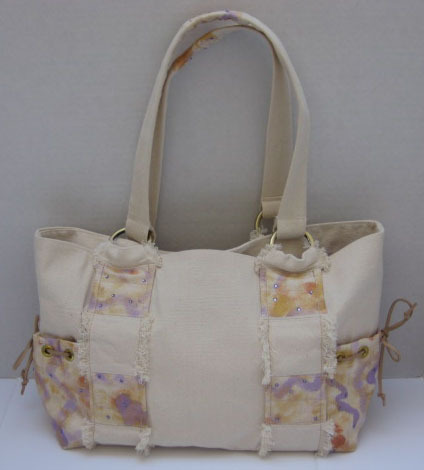 Tote is made of cotton canvas, with hand-painted and fringed detailing. Embellished with swarovski crystals. Grommets on outside pockets, with leather ties. Hand-dyed cotton lining, with inside pocket. Magnetic snap closure. Size is approximately 9-1/4" L x 17-1/2" W, with metal purse rings attached to 23" shoulder straps.